The Turnbull led-Coalition claims to be “resetting” the relationship between the government and the Muslim community. Turnbull has junked reference to “Team Australia”, as well as Abbott’s favoured term for Islamic State, “death cult”. But changing the rhetoric hasn’t changed the substance. Following the shooting outside Parramatta police headquarters by a 15-year-old, Farhad Khalil Mohammad Jabar, Sydney was once again the scene of dramatic terror raids in early October. Many of the same homes that were raided in a pre-dawn operation last year were subject again to a paramilitary-style home invasion by dozens of police with semi-automatic weapons. 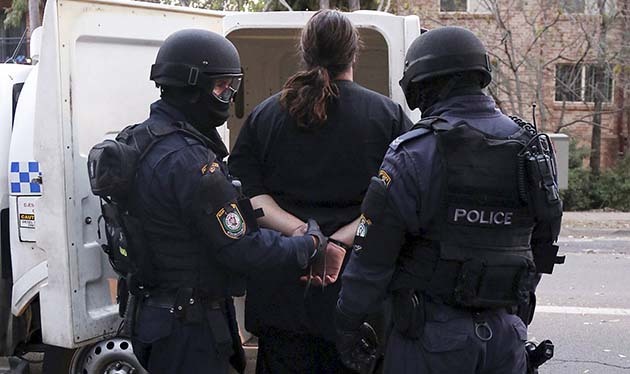 Last year’s raids in Sydney resulted in only one terrorism charge; this time all those arrested bar one were swiftly released. While Turnbull has been praised for saying only a “very, very small minority” of Muslims engage in terrorism, at the same time he talked up the “threat” of radicalisation. He called on Muslim leaders to “come out” and condemn the attack in Parramatta, creating an association between the Muslim community as a whole and the shooting. Minister Steven Ciobo beat the drums harder, saying, “There are radicalised people out there in the community who are looking to inflict harm, looking to murder people”. According to The Australian, the government fears that Abbott’s rhetoric “undermined the ability of agencies to win their trust to help combat radicalisation.” So Turnbull has changed his language to try and recruit Muslim leaders into willing partners in policing their community. Turnbull supported Abbott’s changes to citizenship laws and the Foreign Fighters Bills that have seen Muslims stopped from travelling to the Middle East and have placed the community under a cloud of suspicion. The government, the police and the media have all crafted an image of the Parramatta shooting as an attack linked to an organised terrorist group, before there is any evidence of this. The police say they have a “suspicion” that the teenager “did not act alone”—but no proof. Police Commissioner Andrew Scipione made clear that it is all speculation with his statement that police believed “his actions were politically motivated and therefore linked to terrorism”. The police and the media drew connections between the shooter and the raided homes, but none has been uncovered so far. There are reports Jabar’s gun was obtained via a “Middle Eastern crime gang”, yet police admit this is still just a line of enquiry. Channel Nine even suggested that the football grand finals were endangered by terrorism. The Parramatta mosque, attended by Jabar on the day of the shooting, offered their full cooperation to a police search and decried the act of violence. Yet dramatic news footage of the mosque presented it as the scene of an evil crime plot. The mosque has faced harassment, with journalist Mohammed Taha tweeting that, “Parramatta Mosque told me they’ve received online threats after #ParramattaShooting, one threat to ‘blow up’ the mosque”. Yet the federal government’s 32-page “Radicalisation awareness information kit” was released to astonishment and ridicule less than a week before the shooting. One case study in the booklet, Karen, presented “the alternative music scene, student politics and left-wing activism” as a gateway to “terror”—which in this case consisted of forest sit-ins and protests. Making a link between terrorism and protest is not just accidental. The Howard government did the same with their crackdown on the APEC protests against George W Bush in Sydney in 2007. The kit, mirroring the discussion around radicalisation, contains no suggestion of why a small minority of people may be attracted to terrorism. The “signs” are listed as “significant behavioural changes” in “close personal relationships”, use of the internet, and increased criminal activity. There is nothing in the booklet about Western occupation and bombing of Muslim countries like Iraq, Afghanistan, Syria or about the West’s support for Israeli aggression against Palestine. Nor is there anything about the alienation, the racism or police harassment that creates seething resentment among those who are the victims. Overwhelmingly, it is the Islamophobia at home and abroad that drives radicalisation. But a government that is so keen to bomb Syria and beat up the terror threat at home is incapable of understanding that.